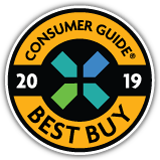 In order to stay current with the latest automotive trends and help consumers select the best vehicle for their needs, the Editors of Consumer Guide® Automotive test drive more than 150 new vehicles each year. We select the top ones in each class as Best Buys. This is our highest ranking. A vehicle does not become a Best Buy based solely on objective ratings. It also has to distinguish itself as being a good dollar value compared to others in the class. Crossover SUVs continue to enjoy impressive sales growth, most of it at the expense of traditional passenger-car sales, which are declining. Many industry observers believe that this trend signifies a permanent shift in American buyers’ tastes, and automakers are allocating their product-development resources accordingly. Ford Motor Company announced in April 2018 that it was phasing out almost all of its traditional passenger cars over the next few years; the only “survivor” is likely to be the Ford Mustang. Ford will be focusing the majority of its resources on trucks and SUVs, as well as hybrids and pure-electric vehicles. Other manufacturers haven’t made official statements as specific as Ford’s, but most of them are moving in a similar direction. GM has announced that several of its passenger cars, such as the Chevrolet Impala and Chevrolet Sonic, will be phased out after the current generations of the vehicles run their course. Electric vehicles are proliferating as well, though at a slower pace than new SUVs. As of now, only a few pure-electric vehicles are offered in all 50 states, but that is changing as new EVs continue to be introduced—and new public charging stations continue to be built. Many luxury-brand automakers have new EVs in the works, and many of them are overtly focused on high performance. Some—but not all—mainstream manufacturers are pivoting toward EVs as well. Ford has announced that it has six pure-electric vehicles planned for introduction by the 2022 model year. As has been consistent throughout automotive history, luxury and connectivity features continue to “trickle down” into less-expensive cars. It’s not uncommon for leather upholstery, heated seats, a navigation system, Bluetooth connectivity, and Apple CarPlay/Android Auto functionality to be offered (or standard) in even subcompact and compact cars and SUVs. Semi-autonomous driving systems—such as Mercedes-Benz’s Drive Pilot and Cadillac’s Super Cruise—are at the current cutting edge of production passenger-vehicle technology. Those systems are mostly restricted to high-end luxury-brand vehicles for now, but the mainstream brands aren’t far behind. Nissan already offers ProPILOT Assist—a driving-assistance system that includes some semi-autonomous functions—in most of its model lineup. Likewise, new safety features are constantly being introduced. With a cocoon of airbags already being common in most vehicles, the emphasis has been on avoiding an accident in the first place, via “active safety” features. Many vehicles are offering forward collision warning with automatic emergency braking, lane-departure warning and intervention, lane-keep assist, blind-spot alert, cross-traffic alert, and rear-obstacle detection, in some cases as standard equipment. And, thanks to a recent government mandate, rearview cameras are now required in almost all new vehicles.